One of the most underrated of the “second tier” groups signed to Motown in the mid-Sixties, the Elgins were formed in 1965 by the merger of two long-term Motown signings who’d struggled for attention and releases, male vocal combo the Downbeats and singer Saundra Mallett Edwards. The newly-configured group was an immediate success; adopting the name Elgins, after the prestigious watch company (a name originally wanted by the Temptations! ), they recorded several highly-regarded singles and an album, Darling Baby, released in 1966. 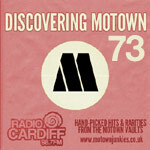 The group notched some low-level chart hits but still suffered from a lack of promotional push and attention from Motown, despite the efforts of the Holland-Dozier-Holland songwriting and production team (recruited into their corner because one of the Elgins was Brian Holland’s barber!). The Elgins eventually broke up in 1967, but reformed in 1971 (with another new singer, Yvonne Vernee Allen) when one of their old Motown singles unexpectedly cracked the Top 3 in Britain.